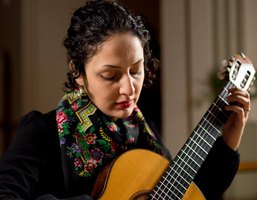 Bahar Ossareh is an Iranian-Canadian classical guitarist who is committed to bringing the beauty of guitar music to the attention of her audiences. Her passion for sharing her love of music with others has led to her development as a skilled and expressive performer. She is admired for her warm sound, soulful performances, accomplished stage presence, and innovative repertoire choice. Ossareh often performs pieces from around the world including, for example, Canada, US, Turkey, Spain, and Latin America, as well as Persian contemporary compositions and her arrangements of Iranian folk songs. Canadian guitarist and composer William Beauvais praised her as: “A player of tremendous expressive range, who enchants listeners.” and has dedicated his new composition “Bhagom” to her. In 2016 Bahar moved to Canada and, to date, has performed as both a soloist and chamber musician with established organizations and orchestras. Among these are: the Guitar Society of Toronto, Guitar Hamilton, Musical Lives Cambridge, Niagara Guitar Orchestra, and Brock University Guitar Orchestra. Also, she has performed as concertmaster with the Art University Guitar Orchestra and has played at international festivals such as the International Fajr Music Festival and the Festival of Youth Music in Iran. Bahar is now a board member of the Guitar Society of Toronto. Graduated from University of Art, Tehran, with a Master of Music Degree in Classical Guitar Performance, Ossareh also specializes in music pedagogy. As founder of the first Iranian Kids’ Guitar Orchestra, she has arranged and composed more than 20 classical and popular pieces for this orchestra of 24 guitars. Now, with more than 12 years of music education, she pursues her love of music by continuing as a guitar player and instructor in the Greater Toronto Area. Bahar Ossareh’s participation is co-sponsored by the FIU Mohsin & Fauzia Jaffer Center for Muslim World Studies.